Tricky match to call. Hibs rarely laid a glove on Celtic last weekend, but were organised and competitive. They should get more chances against a Rangers team which is more generous and unpredictable than their Old Firm counterparts. With Steven Gerrard’s Gers due to take on Aberdeen in a massive cup replay on Tuesday, it would only be natural if they had one eye on that. This Hibs squad have proven that they can rise to the big occasion at home, but their lack of creativity and injury-inflicted options, allied to Rangers’ potency in the final third, suggests to me that the hosts won’t win this. For me, a draw is the best Hibs can get from this match, but I really wouldn’t be surprised if the visitors leave with the loot thanks to Alfredo Morelos. Prediction: Rangers to prevail by a goal. 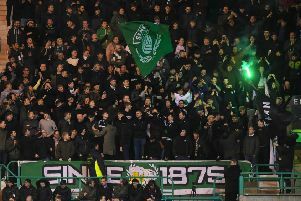 There was a general feeling among the supporters that Hibs paid too much respect to Celtic last week and there wasn’t the same in-your-face confidence witnessed against the champions as there had been in Leith during Neil Lennon’s tenure. Paul Heckingbottom would do well not to do the same with Steven Gerrard’s side. While they are the second-best team in the country, they have suffered their fair share of domestic humblings this season and if Hibs have confidence in themselves to go out and beat them they can get a result. Prediction: Draw. While I don’t expect Hibs to be as meek as they were at times against Celtic, I still think Rangers will be too strong. The lack of pace in the Hibs team is an issue, while the likes of Ryan Kent, Alfredo Morelos and Daniel Candeias could inflict a torrid 90 minutes on the Easter Road defence. Paul Heckingbottom also has a big call to make in midfield with Vykintas Slivka suspended and a lack of natural wide players. The atmosphere at Easter Road will be such that there is little chance of a placid start from either side. Hibs have to be wary of being too aggressive in their approach to the game in terms of committing too many players forward or pressing too high as Steven Gerrard’s side are adept at absorbing such pressure and hitting teams on the counter-attack. Paul Heckingbottom’s side will need to be smart, play with tempo but be more street-wise in when they engage the away side. Games between these sides have been very narrow this season and I expect that to continue but with Alfredo Morelos being the difference. Prediction: Narrow Rangers win.